Brain Injury: My husband fell while ice skating. He had five hospital stays within two months. Holes were drilled into his head to relieve the pressure and later he needed a craniotomy. One year after the injury he was hospitalized again with the chronic pain condition, Trigeminal Neuralgia. He has daily headaches and anxiety. Since the accident he has had difficulty in doing tasks that came easy to him during his building career. 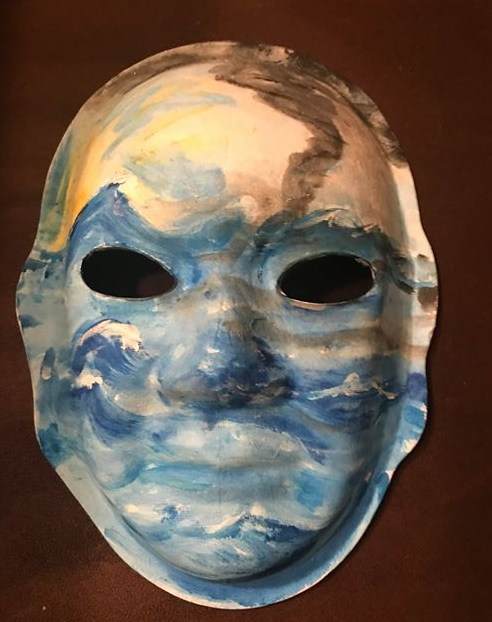 Explanation of Mask: Life after brain injury is a stormy sea sometimes, but there is also light from the sun breaking thru. Grateful that it’s not worse, but he lies with daily pain and a crazy “spinning feeling”.